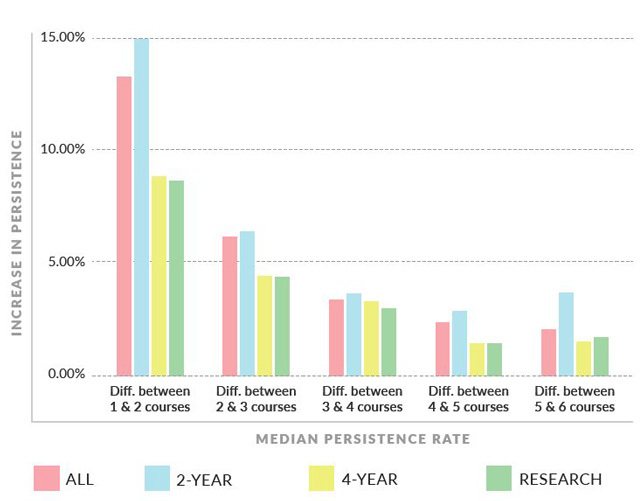 Differences in persistence rates between number of courses attempted, by institution type. Courtesy of Civitas Learning's "Community Insights: Issue 3"
"Fifteen to Finish" is a catchy phrase to encourage students to take enough credits for on-time graduation. In fact, it has been so popular that since the University of Hawaii introduced it as part of a student success initiative, dozens of campuses across the country have borrowed the phrasing for their own campaigns. Now, new research from Civitas Learning is questioning whether that one-size-fits-all slogan is over-simplifying the goal. Civitas produces an application for helping institutions use their own data to fine-tune and improve student outcomes. In a new report issued today, the company examined data from 60 institutions representing almost 1.4 million students to understand the impact of pressuring all students to take at least 15 credit hours per semester to finish within the allotted two or four years. What's missing from that discussion, the report suggested, is nuance — particularly regarding part-time students. "There is a considerable difference between encouraging a student who is taking 12 credit hours to take 15 next semester and asking a student who is currently enrolled in two courses to take five courses," the researchers pointed out. Whether it's due to family or work commitments, lack of financial aid or some other reason, part-time students are typically taking fewer courses for "life and logistical issues that just won't budge." Colleges and universities that are seeking to improve student success, the report noted, should consider "focusing on the number one — as in one more course." The research examined median persistence rates across all institutions based on number of courses attempted. The most significant difference was seen between students taking one course and those taking two, no matter what type of school. The largest increase (nearly 15 percentage points) occurred among community college students taking one course per term vs. those taking two. And although the differences were smaller as the number of courses grew, at each level there was still a boost in the median persistence rate for taking that one extra course. The report includes case studies for specific schools. For example, South Texas College, a Civitas customer, found that students who enrolled in one course had a persistence rate of nearly 69 percent, while those who enrolled in two courses showed a persistence rate of 76 percent. So the college shifted from an outreach plan that encouraged part-time students to go full-time and for full-time students to enroll in 15 credit hours, to a plan that sought ways to nudge part-timers to register for an additional one or two courses. "Research shows that students who can take more classes on a focused path to a degree, should, because it helps them succeed at higher rates. Whether it's 15 in a term, 30 in a year, or just one more class," said Davis Jenkins, a Civitas Learning adviser and a senior research scholar at the Community College Research Center, in a prepared statement. "This report adds another important component to this conversation regarding the on-path progress of part-time students, who are a large part of the higher education mix." Added Mark David Milliron, co-founder and chief learning officer at the company, "This report is intended to help catalyze a broader conversation by drawing more attention to students who are sometimes forced into the 'reporting shadows.' When an institution has a better picture of all their students, part-timers included, they can provide more precise support, recommendations and encouragement — and significantly improve outcomes as a result." The report, "Community Insights: Issue 3: Emerging Benchmarks & Student Success Trends from Across the Civitas," is available with registration on the Civitas website.